This past spring the opportunity for Nature’s Way Compost to get into the spreading business presented itself when production was unable to keep up with demand. In an effort to keep the compost business going strong and increase customer satisfaction, a decision was made to expand the company to include application. “We no longer have to rely on someone else to keep our product moving forward. It’s just something we had to do in order to keep operating our business the way that we wanted,” said Braden Gibson, partner of NWC. With more than fifteen years of successful composting, Nature's Way Compost now operates two new spread trucks. 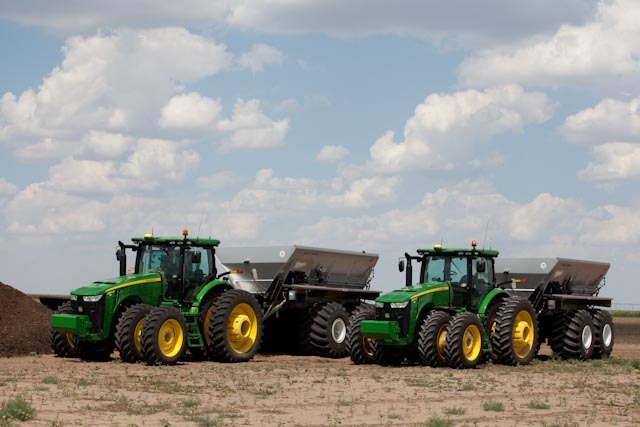 Expansion of the business has allowed Nature’s Way Compost to better serve their farming clientele, and keep up with the growing demand of application on customer fields across the Texas and Oklahoma Panhandle. Nature’s Way Compost is a family owned operation that believes in the nutrient value of their product for the dry Panhandle soil. For more information about Nature’s Way Compost visit their website at www.gfnwc.com.